When I reviewed the first batch of third-party Web browsers for the iPhone, one of the things I was looking for was a browser that made it easy to read sites such as Macworld or Digg by opening clicked links in a background tab. Unfortunately, none of the eight browsers I looked at back in January did this really well. Enter iCab Mobile, a self-described “little brother” to the venerable iCab browser for the Mac. iCab Mobile’s tab handling not only makes reading such sites a breeze, but offers perhaps the richest feature set of any iPhone browser, Safari included. That’s a strong statement, but after using iCab Mobile for the last few days, I think it’s well-earned. iCab Mobile works in portrait or landscape mode, or you can lock it in either mode if you prefer. 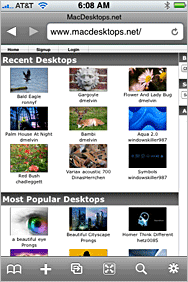 There’s also a full-screen browsing mode that removes anything other than Web content. You enter full-screen mode by tapping a button, and exit it by either shaking the iPhone, or tapping the screen with three fingers. Zooming and scrolling are smooth and work as expected, in both portrait and landscape modes. iCab uses a tab-centric design, though the way tabs are implemented is more window-like than tab-like—there aren’t visible tabs within the window as you’d see in most any desktop browser. Instead, each tab appears on an Open Tabs page; click any listed tab to switch to that tab in the browser. This is the only way to switch tabs; you can’t flip between them via a swipe, for instance. While not as convenient as in-browser tabs, it’s a good solution given the limited screen real estate of the iPhone. For link-heavy sites, iCab Mobile offers a variety of ways to manage what happens when you click a link. Using the program’s options screen, you can set—independently for links to the same domain and links to other domains—whether a link opens normally (as defined by the Web site, either in a new tab or the same tab), in a new tab, or in the current tab. You can also specify to be prompted for link handling; with this feature enabled, a pop-up menu containing these same link-handling options will appear after tapping a link. Unlike the tabbed browsers in the first batch of programs I reviewed, iCab Mobile actually grabs the content for the background tab—so when you do switch to a background tab, you’ll find that it’s already populated, instead of then having to wait for the content to load. Very nice. To help keep track of tabs opening in the background, the tab indicator at the bottom of the screen counts up the number of open tabs, at least to nine. After nine, you’ll just see an asterisk. If you’ve set the option to always open links in the background, this tab indicator also blinks to remind you that you’re creating new tabs with each tap of a link. 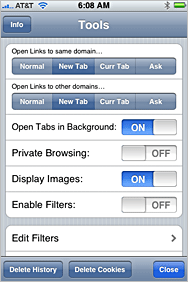 Beyond the nice tab handling, iCab Mobile also offers settings to enable private browsing mode, to disable image downloads (which greatly speeds site loading on slow connections), and to activate advertising filters. These filters are simple URL strings, such as http://*.doubleclick.net*, that will then block those sites from downloading anything to your browser. The list can be edited, and you can add your own filters. iCab Mobile can save and fill in form data, too. This feature worked well, though it’s limited to filling in forms on the same site, not saving general information fields (name, e-mail address, and so on) for use on any page. You can use wildcards in stored URLs to make some data work on other pages within the same domain, but this will only work if the form is the same on those pages. If that’s not enough, you can add your own search engines with relative ease—you just need to run a search on the site first, and then enter the URL with a special variable substitution code (“%@”) in the right spot. I used this feature to add macosxhints.com to the list of search sources, and it worked perfectly. You can import and export bookmarks using iCab Mobile’s built-in webserver. Start up the server, connect to the IP address displayed on your iPhone, and you can import bookmarks (saved in HTML format) from your Mac or PC, or export iCab’s bookmarks. As a test, I imported my huge (nearly 500KB) Firefox bookmark list, and iCab Mobile handled it quickly and without any troubles. Finally, iCab Mobile includes extensive help documenting all its key features—tap the Gear icon, scroll to the bottom, and tap iCab Mobile Help to browse the nicely-organized help files. I only have three real complaints about iCab Mobile, and the developer can’t do anything about two of those issues. The one problem the developer may be able to address is that iCab Mobile would occasionally crash, dumping me back to the main iPhone screen. Some of these incidents were clearly my fault, as I was opening way too many tabbed pages given the limited memory available. For those situations, a low memory warning—if possible—would be a welcome addition to the program. Some other crashes, though, occurred with only one or two open tabs, and seem to have been caused by something on the specific page I was loading. After relaunching the app, though, those same pages would load just fine, so I’m not sure what was going on here. The other two problems are things that the developer can’t do anything about—they’re restrictions due to issues on Apple’s side of the iPhone. First, you can’t set iCab Mobile as your default browser. That means you can’t use it, instead of Mobile Safari, for links opened from external sources such as Mail or SMS. Second, you can’t use iCab Mobile to access any site that uses Apache’s standard authentication routines. Until these two issues are addressed by Apple in a future software update, it will be impossible for any third-party browser to become my full-time iPhone browser. With that said, iCab Mobile has found a permanent spot on my iPhone for browsing link-heavy sites. There’s just no comparison with Mobile Safari when surfing headlines on digg.com, for instance—iCab Mobile is a joy to use, while I find Mobile Safari painfully slow. It’s not a perfect third-party browser, but it’s the best I’ve seen yet. iCab Mobile is compatible with any iPhone or iPod touch running the iPhone 2.1 software update.